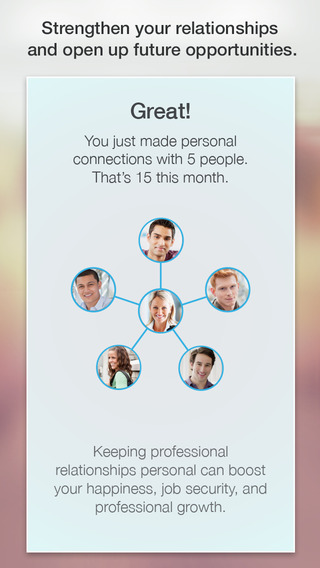 Only a year after the announcement of Contacts on iOS, LinkedIn decided to proceed to a massive rebranding – or replacement to put it correctly – by launching Connected, an app which helps you reach out to people in your network. Contacts had a similar concept behind it. It helped people cultivate professional relationships with people that mattered to them and stay on track with their updates. Moreover, it provided data such as publications and emails of each member – wherever provided – in order to let users have a thorougher look on their profiles. Now, LinkedIn goes a step further with the new iOS app. 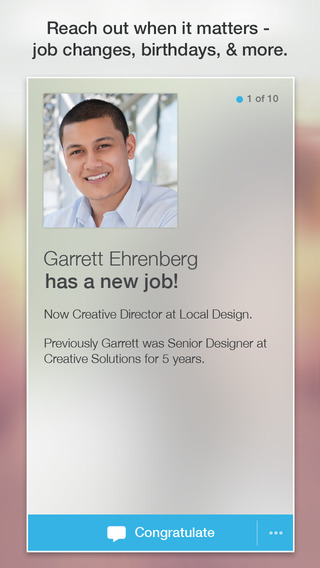 Connected lets you swipe through your notifications and see people who have achieved a major milestone in their career – such as job changes or celebrations. In addition, it syncs with your calendar and pulls profile info about the participants of an upcoming meeting and the people you have already met. #Connected helps you foster relationships with milestone notifications and pre-meeting intelligence. The interface of the new app is based on cards, these simple boxes containing condensed info and picture of users, pretty much like a micro profiles. Each time you receive a message from a card, you can tap on the card and either send a private message or post somethig in public. From the card you can always jump to the full LinkedIn profile, or you can simply swipe up and dismiss the notification. #Connected uses cards in its UI and you can swipe through them in order to interact. The app is available in English language for the time being, and you can download it here. Below you can see all the details reveal by LinkedIn regarding Connected app. Would you use Connected app?